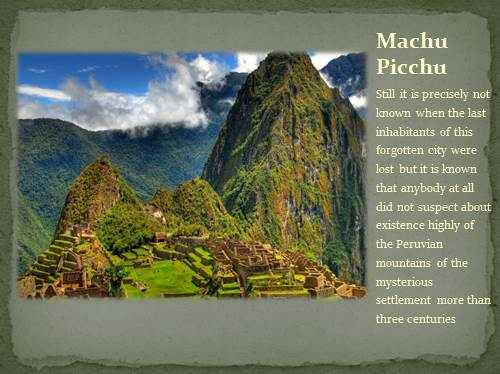 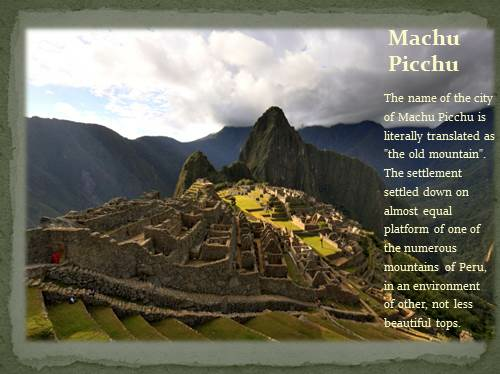 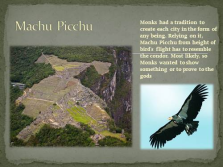 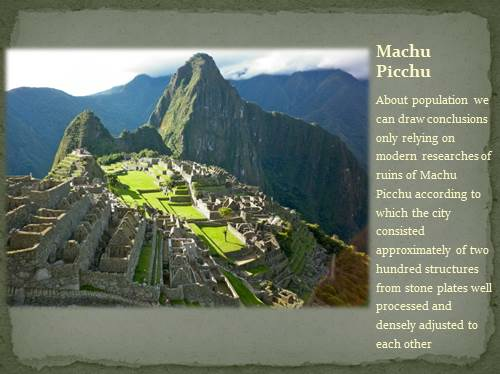 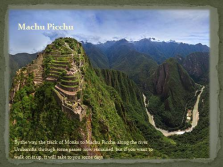 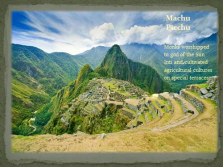 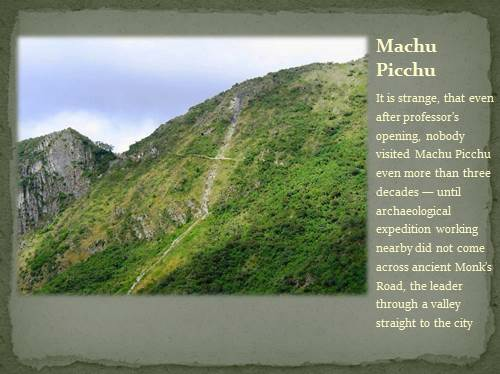 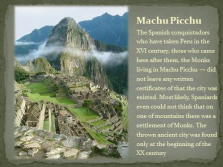 The name of the city of Machu Picchu is literally translated as «the old mountain». 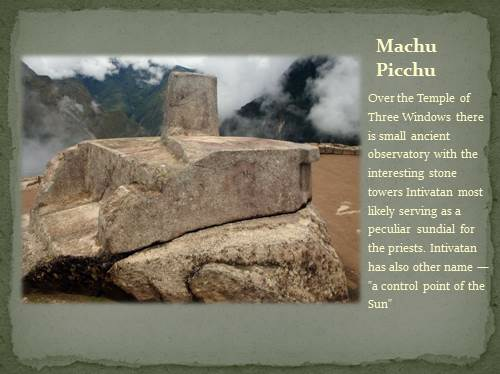 The settlement settled down on almost equal platform of one of the numerous mountains of Peru, in an environment of other, not less beautiful tops. 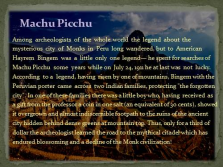 Among archeologists of the whole world the legend about the mysterious city of Monks in Peru long wandered, but to American Hayrem Bingem was a little only one legend— he spent for searches of Machu Picchu some years while on July 24, 1911 he at last was not lucky. 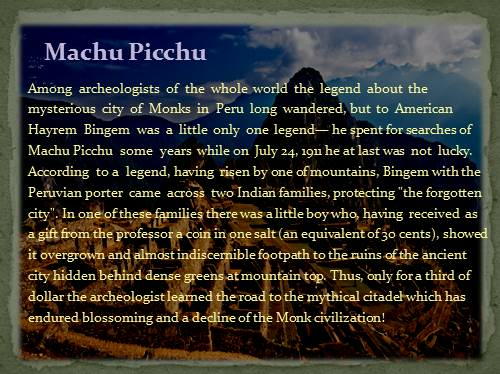 According to a legend, having risen by one of mountains, Bingem with the Peruvian porter came across two Indian families, protecting «the forgotten city». 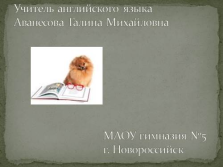 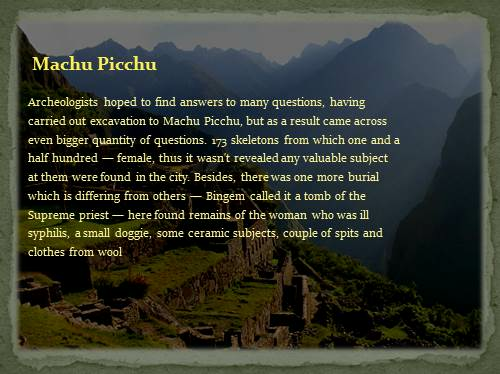 In one of these families there was a little boy who, having received as a gift from the professor a coin in one salt (an equivalent of 30 cents), showed it overgrown and almost indiscernible footpath to the ruins of the ancient city hidden behind dense greens at mountain top. 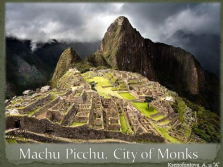 Thus, only for a third of dollar the archeologist learned the road to the mythical citadel which has endured blossoming and a decline of the Monk civilization! 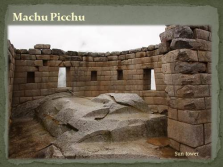 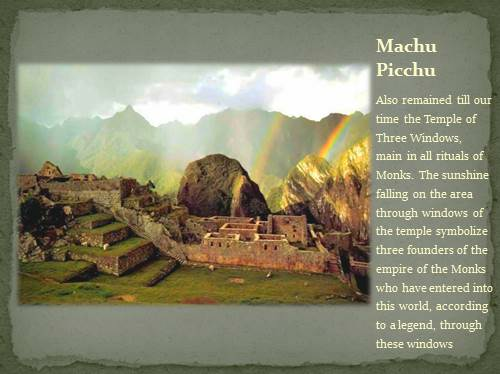 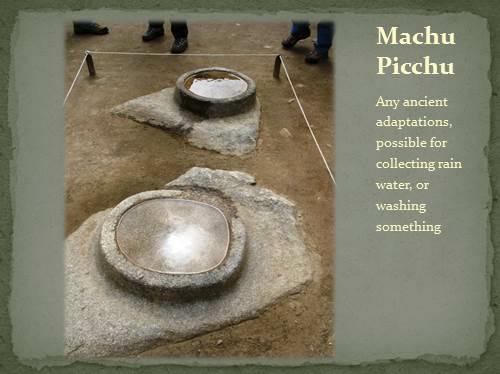 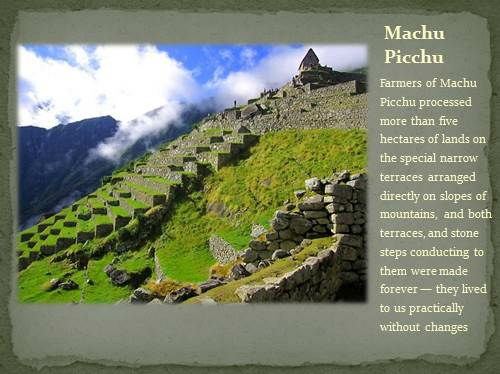 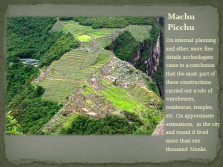 By the way, Machu Picchu — not the real name of the Monk’s settlement. 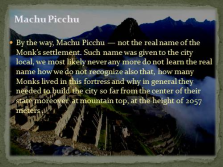 Such name was given to the city local, we most likely never any more do not learn the real name how we do not recognize also that, how many Monks lived in this fortress and why in general they needed to build the city so far from the center of their state moreover at mountain top, at the height of 2057 meters . 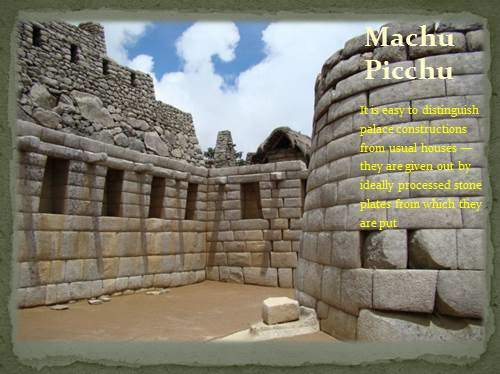 On internal planning and other more fine details archeologists came to a conclusion that the most part of these constructions carried out a role of warehouses, residences, temples, etc. 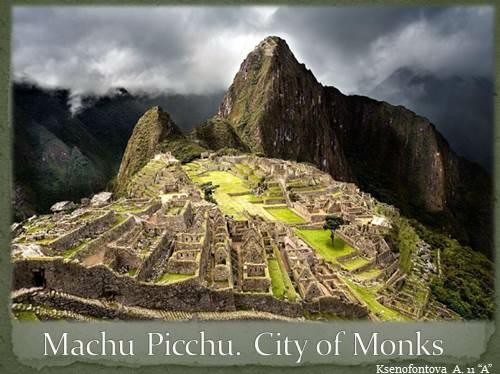 On approximate estimations, in the city and round it lived more than one thousand Monks. 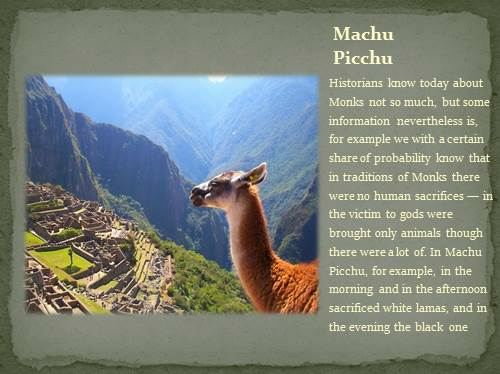 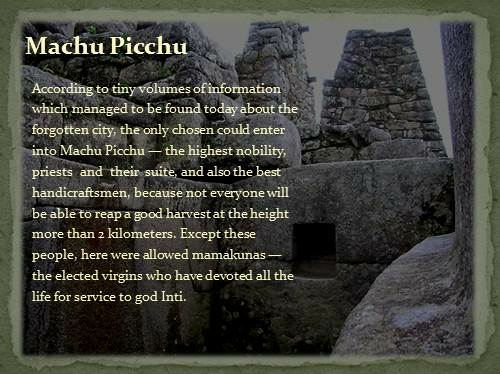 According to tiny volumes of information which managed to be found today about the forgotten city, the only chosen could enter into Machu Picchu — the highest nobility, priests and their suite, and also the best handicraftsmen, because not everyone will be able to reap a good harvest at the height more than 2 kilometers. 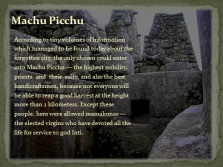 Except these people, here were allowed mamakunas — the elected virgins who have devoted all the life for service to god Inti.